It’s been almost twenty years since Twisted Sister’s swan song album, 1987’s Love is For Suckers. Since then, the band has released some live material, a rerecorded version of Stay Hungry, and some recordings from their early club days. Ever since their official reunion, the prospects of new Twisted Sister material have been iffy at best. However, the band did in fact decide to put together a new album of material after all these years of relative silence. 2006 would definitely see a new Twisted Sister album, a gap of 19 years since the release of Love is For Suckers. When I heard that the new Twisted Sister album was going to be Christmas Music, I have to admit that I was pretty disgusted with the idea. I mean, why would the band go into the studio after nearly 20 years to record an album of anything less than all new material? After their performance at Wacken, I certainly thought the time was right, and fans more eager than ever for new Twisted Sister material. When I first got this album, I was ready to rip it to shreds in my review, promptly label it as “crap of the month,” and chastise the band for not coming up with an album of bona fide new material as opposed to Christmas music. In the time since I received this album, I’ve done two things; 1) I’ve actually listened to the CD and 2) I’ve read some interviews with the band to understand their perspective and outlook at present. Dee Snider is staunchly against older bands that don’t know when to get off the stage. He feel that they are getting in the way of up and coming bands. Also, the band feels that a new Twisted Sister album would not receive much attention in today’s music world, as opposed to a Christmas album which would resonate well, since that holiday is celebrated all over the world. Lastly, Dee Snider says that everything is right with the band right now, with the reunion having been extremely rewarding for the band. 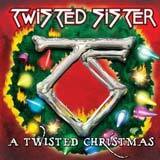 Therefore, they want Twisted Sister to end on a high note as opposed to wearing out their welcome (Kiss, anyone?). With all that said, I now see that it was either going to be an album such as this from Twisted Sister, or no album at all. The band simply doesn’t have the desire or motivation to recorded all new material, and I have to respect them for doing what feels right for them. As for the music on this album, the cynic in me disappears after just one listen! The music is certainly worthy of the Twisted Sister name. Musically, the band has not missed a beat after all these years. Dee Snider’s voice is as powerful and convincing as it was on Under the Blade. The guitar work is tight and crunchy, something that actually surprised me given the theme of the album. The band does an outstanding job of giving these tired old Christmas carols some balls, and delivering a Christmas album that certainly will not become a bore to listen to year after year. As I said before, the band has not missed a beat over the years. Dee’s voice is in great shape, and the musical performances are as good as ever. The riffing is a lot heavier than I expected, and the songs have a genuine Twisted Sister of old sound to them. Of course, the band injects their sense of humor into the music as well. The albums starts with an acoustic guitar and out of tune trumpet backing up Dee who is singing Have Yourself A Merry Christmas. Another band member breaks in by saying, “What is this crap?! This isn’t Twisted Sister! THIS is Twisted Sister,” and the guitars and loud drums promptly begin. The band has released a video to Oh Come All Ye Faithful, which is strongly based on their megahit We’re Not Going to Take It. That may sound stupid that the band has copied its own hit, but it comes across creative as hell. The video is humorous, very similar to I Wanna Rock and We’re Not Going to Take It. A couple is sitting in their living room, when the guy gives his girlfriend a present. She opens it, and is horrified to see that it is a Twisted Christmas CD. She looks at the band picture inside the sleeve, and is disgusted. She starts screaming at her boyfriend when the band breaks into the living room in full makeup and 80’s garb, jamming to the song. By the end of the song, the uptight girlfriend lets down her hair, raises the horns, and is rocking out. The end of the video shows this once uptight girl jumping on her boyfriend, ready for some holiday action. Again, Twisted Sister hasn’t changed a bit, and I appreciate that. Another funny moment would have to be the “Fa-la-la-la-la” in Deck the Halls. The chorus lines sound like a bit too much spiked eggnog was enjoyed by all. And a tattoo of Ozzy…. Although the band has no desire to carry on beyond this album, it’s clear that they’ve still very much got “it.” At any rate, this album has taken someone who hates Christmas carols and the idea of a metal Christmas CD, and pleased me from start to finish. Although this isn’t my idea of what Twisted Sister’s final studio album should have been, they’ve delivered an excellent product that is very much worthy of the Twisted Sister name. Certainly not an album to take seriously, but it does deliver quality musicianship and boatloads of creativity.